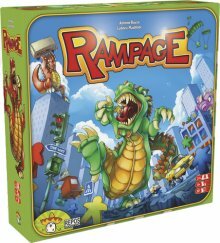 There had been some rumors about a destructive monster game from REPOS PRODUCTION already before the SPIEL '11 convention, but now - 2 ½ years later - the new game Rampage finally has hit the shelves. 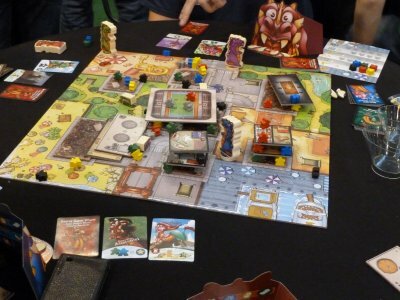 Just like King of Tokyo, Rampage challenges the players to take the roles of movie monsters on a destructive trip, but instead of solely fighting each other the players now have a new primary target to crush, crumble and chomp - MEEPLE CITY and its "meeplish" inhabitants. Of course, fighting among the player-controlled monsters is allowed and encouraged, but the most important aim of the game will be the consumption of meeples. Before the destructive trip can begin, the players set up a three-dimensional city gameboard, featuring six buildings of different size and height. Each of these buildings consists of several floors, but instead of pillars supporting the floors a number of meeples will be placed on each floor in order to support the placement of the next floor. From a monster perspective, the buildings look like a lovely sandwich of floorboards and tasty meeples! Now comes the decisive question: can this all be turned into a strategic boardgame? The answer is simple - no, it can't. 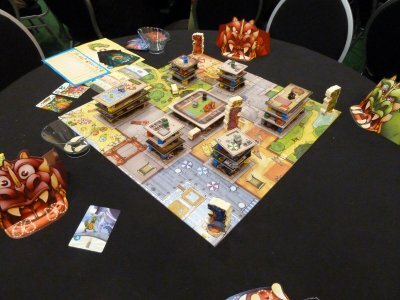 Indeed, Rampage does not even try to be a normal boardgame, but instead it belongs to the species of dexterity games where titles like Carrabande, Dungeon Fighter or Safranito can be found. So, there will be no dice to be rolled and strategic decisions to be made. The players will simply have to rely on their primitive monster instincts and go straight into the fray! The monster figures start the game in the corners of the gameboard, and each figure actually is placed onto a round disk which forms the feet of the monster. When a player wants to move his monster, he removes the figure and then flicks the feet-disk with his fingers, placing the monster figure once again upon the top of the disk when the movement is over. If a monster comes to stand next to a building, it's demolition time! The player takes the monster off its feet, holds it above the building and drops the figure upon the building. This usually will result in the partial collapse of one or more floors, and all meeples falling from these floors into the same neighbourhood can be eaten by the active player at the end of his turn (with the number of eaten meeples depending on the number of teeth in the monster's mouth). Meeples leaving the board during such an attack have escaped, and they will be placed on a special runaway board where they will be sorted by colour. Whenever one of the coloured areas is full, the active monster will suffer a detrimental effect, so that the escape of red "Hero" meeples may effect a 'heroic save', forcing the player to return some eaten meeples to the gamebox, whereas green "Soldier" meeples may call in an 'Air Strike' which results in the monster loosing some of its teeth. If a monster is in the same neighbourhood as a vehicle, the active player can opt to toss the vehicle by placing it onto his monster's head and flicking it with his finger. This is an effective variant because it allows the attacking a building from its side instead of its top. Finally, a player also may opt to place his chin on top of his monster's figure in order to blow a destructive gust of wind into the city. No garlic is allowed here! To give the game some variation, each monster has been assigned a random Special Power by the beginning of the game which allows some kind of special action which is available to that player for all the game. In addition, each monster also gets a Secret Superpower which only can be used once, and a Character card which will be used during the final evaluation. Taken together these powers give the monsters some "personality". The game is over when the last floor of the final building has been destroyed, and now all players will calculate their victory points on basis of consumed meeples and floors and remaining teeth. Each set of six differently coloured meeples will score some victory points, and the Character card of each monster will list some conditions for bonus points. So, a "Romantic" monster will get bonus points for each pair of Hero and Blonde meeples eaten, whereas a "Pacifist" monster will earn bonus points if it has eaten more Soldier meeples than all other players. A "Brawler" even gets bonus points for teeth taken from other monsters, and a "Scrap Merchant" wins points if vehicles end the game on ruins spaces. There is a sheer endless list of possible combinations of Character cards, Special Powers and Secret Powers, and while the basic rules prescribe the random distribution of all cards, a variant suggests that a choice of cards should be given to each player in order to get tailor-made monsters.